Dogs play an underappreciated role in our society. Not only are they our reliable, loyal, and loving best friends, they are eager to serve and help us, too. Dogs guard everything from our families and homes to our livestock and airports. And many of us rely on specially trained service dogs just to get through the day. What do these working dogs do? Do you know how to identify service dogs when you see them? How should you behave around them? Here are a few important facts to know about the dogs whose lives are dedicated to providing invaluable services to their humans each day. A service dog is trained to help someone with physical disabilities and other limitations. For example, people with severe diabetes or epilepsy may have service dogs in case they are suffering but unable to communicate to get help. 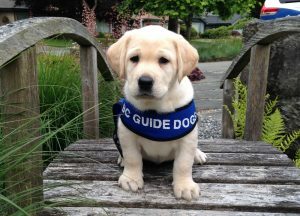 Service dogs can also be assigned to people who are blind or deaf, because they are unable to perform some day-to-day tasks unassisted. Service dogs can provide them with an extra set of eyes and ears, not to mention a friendly and reliable companion whenever their owners need it. Service dogs almost always wear vests that indicate that they are service dogs, not just a very-attentive pet. Usually, service dogs don’t want to be petted. Don’t take it personally! Petting a service dog can be a significant distraction for the dog. If her handler becomes ill while the dog is distracted, then the dog might be unable to perform the tasks that she has been trained to do. Instead of petting a service dog, it might be better to say a kind word to the owner, such as, “It seems like you’ve got a great helper!” Be sure not to interfere in whatever task the dog and owner are involved in, though. If you’re not sure of whether it’s a good time to pay a working dog a compliment, then just let the dog and handler pass by without interruption. There are always plenty of dogs at your local shelter who’d love to have someone stop by and share some dog appreciation with them! There is a slight difference between a service dog and an emotional-support dog. Both of these dogs with jobs often wear vests to help identify them. Emotional-support dogs help provide emotional stability for their owners. People with PTSD, phobias, depression, or disorders that effect moods or behaviors can find a lot of comfort in their emotional-support animals. As with service dogs, it’s best not to distract an emotional-support dog. Admire from a distance, then be sure to go home and give your own dog an extra scratch behind the ear! Finding a new apartment with a good pet policy can be a challenge when it comes to working dogs. The American Disabilities Act (ADA) permits all people the right to live with their service dog, regardless of their landlord’s pet policy. If you’re a renter, landlords cannot force you to pay deposits or pet fees for your certified service dog or emotional-support animal. Dogs just want to be our best friends, and they love doing it! The expert trainers at KC Dawgz hope you’ll join us in saluting the dogs who improve the quality of life each day!